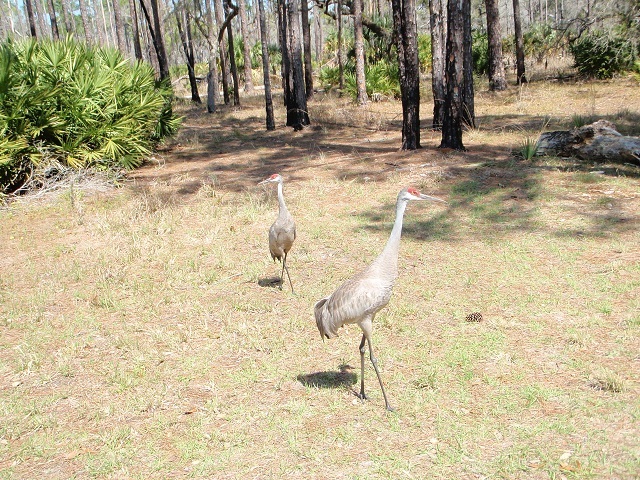 This State Park’s flatwoods, floodplain marshes, scrub, hardwood hammocks, lakes and waterways teem with birds and wildlife. On the drive in (and inside the park), watch for Crested Caracaras, Sandhill Cranes, Bald Eagles and Northern Bobwhites. The entrance station is a good spot for Florida Scrub-Jays. Watch for Red-Headed Woodpeckers in the flatwoods along the long park entrance road, then hike over to the observation platform at the picnic area. You can walk all the way to the lake, watching for waders and Snail Kites, or take a guided boat tour. Alternatively, rent a canoe and explore the waters for yourself. The cow camp area across the bridge from the picnic area is excellent for songbird migrants. Butterfly viewers have 70 species to search for here, such as Question Mark, Dorantes Longtail, Monk Skipper and Soldier (rare). The park has 13 miles of hiking/biking trails and 6 miles of equestrian trails. Camping is available, which gives you access to the park at night to prowl for owls and other nocturnal creatures like Bobcats and Gray Foxes. Summers are hot and buggy, so be prepared.